As the social media revolution embeds itself in our daily lives, and as those who once consumed media become producers, established broadcast media producers are witnessing the dissolution of trust in their established authority. 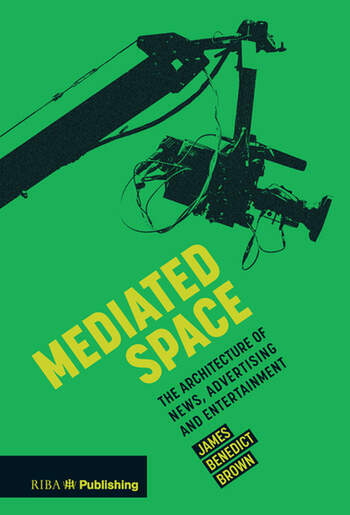 Mediated Space critiques contemporary intersections of Architecture and broadcast media that exploit spaces and places that are real, imagined or hybrids of the two in order to re-establish and strengthen the power of traditional capitalist mechanisms of production and consumption. Examining eight spatial constructions in North America, Europe, the Middle East and Africa, Mediated Space embarks on a global exploration of how architecture, spatial design and technology conspire in the service of global capitalism. In three thematic parts that focus on the automotive space of the city, the journalistic space of the news room and the mediated skyline of the city, Mediated Space makes an architectural critique of spaces that are rarely designed by architects but that are experienced every day by millions of people. Dr. James Benedict Brown is a Lecturer in Architecture at the Leicester School of Architecture, De Montfort University. He is currently Year 1 leader of the BA(Hons) Architecture, and supervises third year undergraduate dissertations. His research is primarily concerned with architectural education and the representation of space. James’ PhD, A Critique of the Live Project (Queen’s University Belfast, 2012) was shortlisted for the 2013 RIBA President’s Award for Outstanding PhD Thesis. He produces the Arch. Ed. Podcast, and is a founder member of the Association of Architectural Educators (AAE), for which he is currently the Series Editor of the peer reviewed academic journal Charrette.